HR-1031 Radio Modem with the high speed data radio is designed to be Long distance and high performance wireless data radio modem. The new design makes the modem more flexible for different application in various configurations. Basically, this type of modem is SMART enough to be customized to best meet end user’s requirements. It has a small volume, metal shell, high shield performance and high anti-jamming performance. It adopts integration power set free and TXCO and so on high reliability parts. 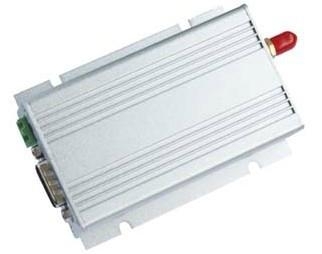 It adopts GFSK modulation, so it enhances the using rate of the frequency resource and the anti-jamming performance. * Data communication used for railway, oil field, dock and army. Key words: Wireless Data Transmission, Radio Modems, RF modules, rf transceiver modules, Wireless Module,Wireless Data Transceiver Module, RF Module, RF Data Transceiver Module, Radio Module, Radio Modem, VHF Module, ZigBee Module, GSM/GPRS Module, GSM GPRS+GPS Module, VHF and UHF wireless, OEM and ODM modules, RF transmitter, RF receiver, Wireless Video, long range Radio Modems, Radio Telemetry, Wireless CCTV, PTZ, wireless remote control, Modbus, RS485 profibus, audio modules, I/O modules, ON-OFF modules, analog acquisition modules, RS232 connector/port, RF module 433MHz, GSM/GPRS, Embedded wireless module, Telemetry, monitoring, low cost, Public Utilities, Transport, Traffic, Parking, Industrial Automation, Security, Process Control, Analog Acquisition, Remote Control, Flow Control, Level Monitoring, Alarms, Access Control.